Debates make history fascinating. Art history is no different; Ionic versus doric, spiritual imagery versus iconoclasm, Romanticism versus Realism. Each side proclaiming one merit or another superior. Postmodern Design Complete presents the position of Postmodernism in the 1980s as a reaction against the Modernism of the 1960s which itself was a reaction against post WWII Expressionism, Fauvism, Cubism, Futurism, and on and on. What is notably different about the era of Postmodernism is how widespread it wandered. Typically, in art history, technical architectural advancements led to changes in approaches to sculpture, which lead to changes in painting. Then the cycle would repeat: architecture, sculpture, painting. Postmodern art was no exception here. Architects were the first to recognize the downsides, even pronouncing the failure of modern post WWII buildings that became the scourge of urban centers. Reacting against this bane of society, architects such as Frank Gehry, Charles Moore, Robert Stern in the U.S. and Hans Hollein, Arata Isozaki, and Paolo Portoghesi abroad, unleashed their creative juices with a new philosophy of design. The movement wasted no time in influencing sculpture, although not in a traditional sense. Furniture design took on the role of sculpture with every item fair game in the postmodern world. Bookshelves, chairs, sofas, tables, beds were all impacted. But the touch did not stop there. Household items from tea pots to lamps, jewelry to corkscrews, were all redesigned according to the magic wand of postmodern ascetic. One can almost imagine Cinderella’s fairy godmother bibbidy-bobbidy-booing her way around with a postmodern fanfare. Postmodernism vacillated between high-end one-of-a-kind pieces and mass produced everyday items. It was the mass production that eventually did them in, turning fine art into kitsch and degrading the postmodern label. Another shake up in the art world attributed to postmodernism is the addition of graphic art into the traditional territory of fine art. Henri Toulouse-Lautrec may have invented to poster, but the invention of the Macintosh computer in 1984 catapulted graphic design far beyond the poster. Print media was in high demand in the ’80s with publishers wanting book jackets, music industry requesting record covers, retail stores commissioning shopping bags, and magazine illustrations hitting an all-time high. Together with the mighty computer, postmodernism readily and remarkably filled this graphic gap, lending it consumer power and consequently, artistic prestige. Postmodernism was interested in unique combinations, reinterpretations, unrestricted creativity, inclusivity, pluralism, and a non-linear approach to design solutions. In this book, Gura has assembled a survey of the primary players that connected with these ambitions. By delivering biographies of the individual artists, she has told the story of Postmodern design. 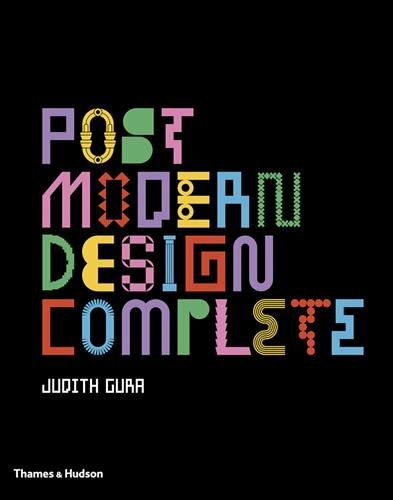 Gura includes essays by leading Postmodern proponents such as Charles Jencks, Hans Maier-Aichen, Arlene Hirst, and Denise Scott Brown with 860 illustrations that exemplify the quintessential achievements of the movement. Postmodern Design Complete provides hefty source material examining how over 150 artists navigated the currents of art history and participated in a collective movement. In turn, today’s generation of artists, architects, and designers have a wealth of expressions to choose from, freshen up and make their own. The future of art is wide open, and postmodernism takes pride in having stirred up the pot.